Once in a while, hard work and sheer luck manage to help each other out for a change, and we might just find ourselves on the verge of realizing a long-hoped for dream. Of course, this happens about as often as a total solar eclipse, so if you ever find yourself in this position do your best to seize your dream with both hands and try not to gloat too much as you’re scampering gleefully away. 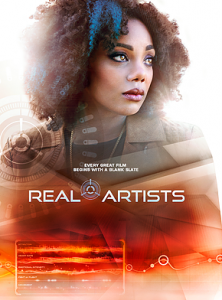 In the short film Real Artists, Sophia (Tiffany Hines) is in exactly this enviable position, having earned an interview for her dream job at Semaphore Studios. She longs to be an animator, and for that this is THE studio to work for. And right now they’re developing Return to Mythos, sequel to their huge hit Mythos, so this is the perfect time to join the team. Sophia’s interviewer is Anne Palladon (Tamlyn Tomita), whose work Sophia has always admired. Even better, Anne is impressed by Sophia’s work and is anxious to get another woman on board. This couldn’t be a more promising start, and you can almost see Sophia telling herself not to mess this up. But there’s a lot hiding behind that non-disclosure agreement she had to sign, and the job may not be quite the sort of dream she thinks it is. Hines is perfectly cast as the hopeful, idealistic Sophia getting her first look behind the curtain, while Tomita shines as the successful woman in a man’s world. (Your MCND fact of the day: women hold only about 20% of animation industry jobs.) 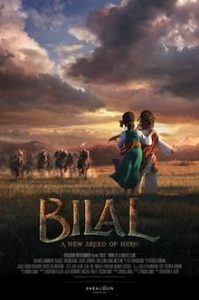 But where the movie really hits home is in its predictions for the not too distant future of animation and movie-making, where it may just be frighteningly accurate. The film quietly puts some unsettling notions into your mind, notions that will haunt you long after the film ends. The real artists behind everything aren’t at all who you expect them to be. Even if your teen years weren’t especially rough, they were probably still pretty awkward. High school kids have to make decisions that can effect the rest of their lives, because those are the kinds of decisions everyone is equipped to make at seventeen. College is expensive and not necessarily for everyone in the first place, yet everyone tells you that you have to have some higher education. And then there are other, equally pressing problems, like being one of the cool kids — or, as in the short film Beauty Queen, being one of the pretty kids. The camera never lies. Or does it? 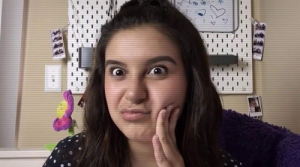 Christina (Christina Goursky) isn’t not pretty, if you’ll pardon the double negative, but neither does she look like a model the way all the other girls in her class seem to, and this bothers her. In a truly spectacular backfire, her gender studies class seems to have made her much more conscious of her looks after nearly every other student in the class says they’d rather be called pretty than smart. Even one of the guys agrees, though the teacher (Sally Eidman) promptly scolds him. I’m not sure this particular teacher really gets the point of a gender studies class. Anyway, Christina has decided that she’d rather be called pretty than smart, too, and throws herself into the deep end by trying out for modeling jobs, which is rather like trying to take up jogging by entering a marathon. Her dad David (Timothy J. Cox) couldn’t be more proud of her, or more encouraging, but dads generally tend to think their daughters are both pretty and smart no matter what, and Christina is searching for something more objective — and searching in all the wrong places. One way or another we can all relate to Christina’s quest — everyone needs reassurance about themselves sometimes — and the movie is quietly convincing, not to mention sweet and touching. David is the dad every girl wants, but now it’s nearly time for Christina to head off to college and out into the world, and it’s only natural for her to have some last-minute nerves. There’s a delightful father-daughter bond between the two that helps keep Christina grounded, and Goursky creates a realistic character that pulls the viewer into her story. It’s a satisfying slice of life that might need to be required viewing in your next gender studies class. Unrequited love can be utterly wretched. And it’s one of those rotten things that nearly all of us have in common, because hopeless crushes can strike anyone at any time. Most of us just cope with it one way or another — we mope around the house for a while, try to avoid the object of our affections until things are less fraught, or simply drown our sorrows in ice cream. It’s no fun and we can be pretty miserable for a while, but we get through it because we have to. Unfortunately, once in a while unrequited love can turn into obsession, as happens in the short film Hush, and at that point all bets are off. Jeremy (Anthony Scanish), you see, is so madly in love with Suzanna (Melissa Damas) that he imagines them together constantly. Her husband Mark (Erik Searle) naturally doesn’t enter into these fantasies in the slightest, just as Jeremy’s wife Betty (Kristin Anne Teporelli) doesn’t matter anymore, either. Complicating the situation is the fact that all four are friends, often visiting with each other and another couple. So Jeremy avoiding Suzanna until his emotions settle down isn’t really an option, but as it is things are increasingly stressful between Jeremy and Betty, who knows something is very wrong but isn’t sure exactly what’s happened. Jeremy doesn’t seem to want to get over his obsession anyway, instead letting it pull him deeper into his ever more dangerous fantasy world. And when the situation finally reaches a crisis, it will do so in a way that no one is expecting, probably not even Jeremy. 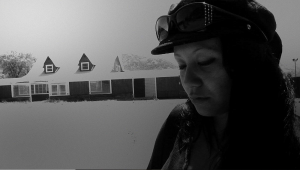 It’s an all too familiar story, told here with sparse, quiet tension. There’s no dialogue, but there doesn’t need to be, the story unfolding bit by bit through the fascinating imagery of Jeremy’s daydreams and his life, the latter dull and colorless compared to the thrilling, vivid scenes of his imagination. It isn’t hard to understand why he’s so anxious to make dreams into reality, except all his wife and friends see is him losing his grip on reality. The ending is both shocking and inevitable, though unfortunately not entirely surprising. It’s an alarmingly realistic look at the results of one person’s obsession, with powerful images that you won’t be able to look away from. Probably some of the weirdest and wildest stories from established actors are about how they got their big break. Hopefully not too many of these stories involve actual crimes, because there’s all too much of that in Hollywood. In The Big Take, however, the crimes get wildly out of hand when the search for funding for an indie film — something that doesn’t normally lead to anything more nefarious than a pushy kickstarter campaign — instead sets off a chain of blackmail, burglary, assault, and worse. It starts when aspiring producer Vic (Slate Holmgren) runs into famous actor Douglas Brown (James McCaffrey) at the exclusive club where Vic works. When Douglas — unsurprisingly — turns down Vic’s offer to star in a low-budget movie by a couple of broke unknowns, Vic seeks revenge. I’m not sure what he originally had in mind, but after he roofies Douglas things take a direction I’m fairly sure Vic would never have predicted. He’s still quick to take advantage of events, however, and the next thing Douglas knows he’s being blackmailed for the $200,000 bankroll Vic needs to produce the film his friend Max (Ebon Moss-Bachrach) has written and hopes to direct. You don’t want to mess with Oxana. A panicked Douglas turns to his agent Jack (Bill Sage, who somehow reminds me of Brad Pitt now and then) for help. Not to worry, Jack says, he can spin anything. When he gets a look at the blackmail material, however, he decides sterner measures are needed and he contacts his “fixer”, Frank (Dan Hedaya). Pronouncing the blackmailers to be amateurs — and he couldn’t be more right there — Frank is confident he can solve this problem easily. Unfortunately, Vic has accidentally left a clue that points straight to Max, who is blissfully unaware of any blackmail and thinks that Douglas is bankrolling his movie because he likes it. When the overconfident Frank fails to retrieve the blackmail material — Max is pretty much a pushover, but his feisty Ukrainian wife, Oxana (Oksana Lada), not so much — the fixer calls in his own fixer, Edie (Zoë Bell). It’s at this point that things get completely out of control, with alliances made and broken, houses robbed, people shot and kidnapped, and generally desperate measures taken all around. Aside from having the misfortune to get caught up in events in the first place, Max is otherwise so ridiculously lucky as to strain credulity — Frank and Edie veer back and forth between incompetence and absolute professionalism, whatever it takes to help Max survive at any given moment. And Max doesn’t really have much else going for him besides luck and his wife, the character being otherwise unremarkable. Then there’s the nature of the blackmail material, which is first of all completely tasteless, and second of all far more useful for blackmailing the person who’s with Douglas on the video rather than Douglas himself. There is good news, though, in that the script is otherwise well-written and the performances solid, with an excellent blend of action and comedy. Most of the characters are wacky but likable, though Vic occasionally struck me as a possible sociopath. The zaniness gets a bit too zany for my taste here and there, but it’s otherwise an entertaining romp through the roller-coaster world of Hollywood that is often laugh-out-loud funny. Breaking into the movie business can really be murder. Written and directed by Justin Daly. Now and then, many of us have probably wondered how we survived our childhoods, since so many kids firmly believe they’re indestructible and nothing truly bad will ever happen to them. Most of us outgrow this phase and sometimes marvel at the chances we so blithely took in younger days. And you don’t even have to have been particularly daring for bad things to happen anyway — you never know when a freak accident might be lurking around the corner just waiting to get you. In The Girl Who Wasn’t Missing, Echo (Kai Lanette) roams freely through an urban wilderness that, inevitably, claims a terrible price. Echo faces life on the streets. Echo seems to live in a less-prosperous area of southern California, judging from the palm trees and the general air of self-absorbed disinterest that seems quite common around there. Certainly Echo’s parents don’t seem concerned about their daughter’s habit of wandering alone through the neighborhood, even though she’s only 15 and blissfully unaware that there are bad people out there. I don’t know if Echo’s mother is perhaps a little more caring, but her father (Rob Dale) is a complete jerk who heartlessly abandons his daughter when she needs him the most. I’d call him worse, but I try to keep things PG-13 here. Left homeless and with nowhere to turn, Echo drifts into a pattern of life on the streets, or rather existing on the streets. Always a loner, there’s no one left now to care whether she lives or dies, and even Echo herself seems largely indifferent to that question. She does what she has to do to survive out of habit, scrounging for places to sleep and subsisting on convenience store food. She may not be missing in the official sense — who would have bothered to file a police report? — but she’s still gone in every way that matters, moving mechanically through her days. There’s a police officer (Jeremy Williams) and a friend of hers (Jerrell Gray) who just might notice if she stopped showing up one day, but aside from them she might almost not exist. This may sound like a bleak, quietly horrifying film, but I’ve barely even scratched the surface of that. The visuals are raw and unflinching, with no grim detail of Echo’s daily life overlooked. Just her struggle to keep herself relatively clean is powerful and painful — a simple shower is an almost unimaginable treat for her, and a clean place to sleep a rare privilege. Lanette does a superb job portraying the neglected child who transforms into a child of the streets, hiding whatever might remain of herself behind brittle sarcasm and bravado. Her new life both ages her and keeps her a child in many ways, wandering alone and lonely through her new world in much the same fashion she did through the old, accepting both with the same resignation. Done in documentary style, this expertly crafted film brutally reminds us that the true plight of the homeless and the lost is infinitely worse than most fiction ever allows us to see, and that those who lead these twilight lives are as real and human as any of us. Remorse is the poison of life. I can’t take credit for that line; I’m quoting Charlotte Bronte. But it’s very true that just a moment’s inattention can allow tragedy to happen, and after that moment lives can be ruined. 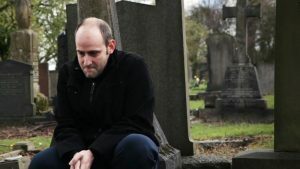 In The Nonduality of Perry Atman, for the title character (David Christopher-Turner) and his wife (Catherine Hearne), that moment leads to the death of their young daughter, Catlin (Lucy Turner) in a freak accident. Three years later, Perry’s wife is muddling forward as best she can, but Perry refuses to resign himself to the facts and spends hours in their shed, which he’s converted to a workshop / research center dedicated to the study of time travel. They need to get back to that awful moment, he reasons, and make sure they have a happy ending, so time travel is the obvious solution. His wife is increasingly frustrated by his obsession, but Perry can’t back down, not now, when he feels he’s so close. And one day, all his hopes are realized when he receives a message from his older self, giving detailed instructions on how to save Catlin. Following a voice from the future is a difficult and dangerous task, however, and time travel is an unforgiving mistress. And sending a message back is a far cry from changing the course of history. His grand experiment may succeed — or fail — in ways he can’t even begin to imagine, but he refuses to waver. Low-budget sci-fi can be a very mixed bag, but this short handles that aspect well, borrowing from famous tropes and giving them an offbeat twist. The movie might have benefited from showing a little more of the building tension between husband and wife, but otherwise there’s a good balance of past and present. And overall it’s a quietly poignant short — Perry is a gentle, thoughtful man whose otherwise sharp mind can’t face the terrible truth and takes refuge in the ridiculous — or perhaps it isn’t so ridiculous after all. There’s also a good balance of pathos and humor — the end credits are a perfect example of the latter — that improves them both. It’s a winning combination that might just make you believe in six impossible things before breakfast. 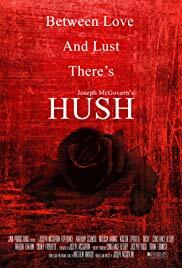 Written and directed by Anthony Sabanskis and available to watch on opprime.tv! We’ve all had times when the world seems impossible to deal with and all we can think of is how terrible everything is. Going to work is pointless at best, people are generally awful and getting worse, and the day just isn’t worth facing anymore. As The Bestowal begins, that’s largely how Steven (Sam Brittan) is feeling, except he’s decided that he doesn’t want to face the entire rest of his life. But as he’s trying to work up the nerve to end it all, a beautiful young woman (Sharmita Bhattacharya) appears from nowhere and begins trying to convince him that life is worth living after all. You never know when Death might drop in for a chat. Given her mission, it’s rather startling when she introduces herself as Death, though she’s more correctly an interdimensional being rather than a personification of human mortality. As far as she’s concerned, though, suicide is a dreadful thing because it’s a death that happens before its proper time, not to mention a death that leaves a soul wandering, lost in torment. She apparently can’t help such souls, so instead she visits the suicidal before they act, trying to persuade them to carry on. Borrowing from Plato — or maybe Plato borrowed from her, considering how fluid time is in this film — she tells Steven that caring about the happiness of others is what gives us our own happiness. Though doubtful, Steven agrees, because it’s hard to imagine anyone not being consumed with curiosity over whether or not Death gives good advice. She promises to come back in twenty years to see how he’s doing. And Steven doesn’t seem to have aged a day when Death returns, something they attribute to his journey towards enlightenment. During this journey, he’s made amazing strides in helping humanity, but the world is still becoming a darker place all the time. Even Death herself is finding it harder to travel between dimensions because of this. Is life as we know it about to come to an end? Or can Death still do something against these vast and powerful forces? Even a lowly human like Steven might still have a part to play. This is an engaging example of cerebral sci-fi, with writer / director Andrew de Burgh mentioning influences such as 2001. As with that classic, the pacing of this film is very slow, and if you aren’t prepared to ponder some deeply philosophical concepts, this isn’t the movie for you. Of necessity, the film tells rather than shows — even a massive Hollywood budget could only go so far in showing the almost unimaginable beings and bizarre dimensions Death speaks of — and the movie blames most of mankind’s ills on technology, which seems a little harsh to me. How else am I supposed to get my reviews read if not online? And at first, Steven’s character is not as sympathetic as he probably should be, though he does soon become more relatable. The good news is that the slow pace generally works well, giving the audience time to grasp the concepts discussed, and something about the actors held my interest despite the fact that there’s nothing here that could be called action. So while it’s a mixed bag, overall it’s a successful experiment, creating a sci-fi realm in which the effects are in the viewers’s own imagination, which is the best sort of CGI anyway. Bhattacharya is particularly well-cast, with a genuine quality about her that helps her move beyond the ‘Death as a beautiful woman’ trope. It’s a promising and intriguing feature film debut for de Burgh, proving that satisfying science-fiction isn’t limited to the big studios. Interested in finding out more? Check out this interview with Andrew de Burgh! The search for bigger and better weapons has been going on ever since one of mankind’s distant ancestors figured out that small rocks hurt and big rocks hurt more. During the Cold War that search sometimes reached epic proportions, with countries everywhere rushing to find something that would keep them from being crushed outright by a stronger country. And of course both the US and the Soviet Union led the charge to “peace” through really big bombs. 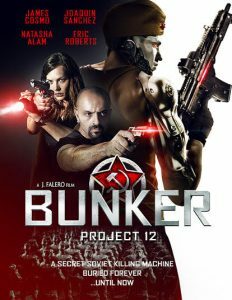 In Bunker: Project 12, however, some Cold War-era mercenaries have been sent after a different sort of super-weapon, left lying in cold storage since the project was shut down at the end of World War II. The team isn’t even sure what they’re after, but they’ve been hired by a very wealthy businessman, John Henderson (Eric Roberts), and he’s paying them enough that they don’t ask too many questions. I’m fairly sure that Bruno (Timothy Gibbs) thinks he’s in charge, or at least wants to be, but as much as they even have a leader that would be Tabeel (Joaquín Sánchez), who seems to be the one thing holding the group together. Well, him and the money, presumably. Along with Irina (Natasha Alam), Alan (Tony Corvillo), and Carl (James Ferguson), they take their first step towards tracking down the mystery weapon by kidnapping Balanowsky (James Cosmo), one of the few people alive who knows his way through the mazelike underground facility that holds the weapon. The Russians want Balanowsky dead so their secret will be safe, and frankly he isn’t a whole lot safer with the mercenaries, especially Bruno. Though Balanowsky knows exactly what they’re looking for, he isn’t talking, and by the time the group starts closing in on their goal, they quickly realize that they’re in way, way over their heads this time. The film starts out a lot like a Bond movie, which is to say that you’re not entirely sure what’s going on or who’s on which side, but you can be absolutely certain that things will explode and a lot of people will get shot. It’s inside the research facility that things really get going, however — the stark, abandoned look of the structure makes its narrow corridors even more claustrophobic and eerie as our “heroes” start to discover who and what their real enemy is. And of course Eric Roberts is always brilliant at looking like he’s up to something, which also helps build the suspense. It’s also about as logical as a Bond movie, which is to say not very logical at all, and it only gets worse at the end. But the action and the tension help pull you in despite this. The characters are interesting and in some cases even strangely likable, despite their dubious profession, and the acting is solid throughout. While you might guess at the secret of the weapon, it’s still a different and intriguing idea that I wish was explored a little more. Of course, the ending leaves things cleverly open for a sequel, so that still might happen. It’s primarily a popcorn flick, but if you can ignore the occasional inconsistency, it’s a wildly entertaining action film. Movies are always having to adapt to changing technology in various ways, sometimes with mixed results. Cell phones, for instance, are ever-present but at least easy to neutralize through dead batteries or the fact that there’s just no reception in these extremely isolated camping sites. Some movies take a slightly different tactic, however, and make the technology at least as much the enemy as any slasher, as in Let’s Chat!, where any online conversation can suddenly turn dangerous — and I don’t mean just a slightly racy game of truth or dare, though that happens, too. Some of the facial expressions alone make it worth watching. It all starts innocently enough, when Luke (Jaimy Homberg) virtually gathers his friends together to invite them all to a Katy Perry concert. Luke’s boyfriend Jesse (James Burleson) doesn’t get what all the fuss is about, and I’m with him, but Elle (Amber Romero) and Nico (JohnPeter Johnson) are terribly excited. Sidney (Billionna Olivia Reyes), however, is stuck babysitting her little brother and is desolate about not being able to go. But the chat has been acting twitchy, even by Skype standards, which I hear are pretty low these days. As the other friends sign off, someone else muscles into Luke and Jesse’s chat, and that someone claims to be the notorious — and recently escaped — serial killer Peter Loft (Johnnie Brannon), whose favorite targets are teenagers. He says he just wants to liven up the conversation, but considering what his idea of fun is like, this is one Skype call Luke will wish he’d never made. It’s rather like a low-budget reboot of Unfriended, and though I wasn’t thrilled with the execution of the latter, it was certainly an interesting idea, so there are worse movies out there to emulate. At least this version has likable characters, which is more than I can say for the original. This is also more technical than supernatural, which is a better approach in my opinion, even if some of the techy stuff here goes a little over the top. It feels too rushed, and the level of acting talent varies, but overall it’s a fun watch with an interesting twist at the end, even if that twist does seem particularly out of left field. But it’s a solid take on a good idea that everyone seems to have had a lot of fun with, and I’m looking forward to seeing more from Homberg.